Jesus was a refugee as a small boy. Already of a humbled background, Jesus’ life became endangered as Herod found out of his royal lineage and the hopes that some in Israel were placing on him. Mary, Joseph and Jesus became strangers in a strange land, just as a previous Joseph had done. Even today, refugee camps can be very dangerous and inhospitable. It is not uncommon to find a full array of people: young/old, poor/rich (now poor); educated/uneducated; families/singles, etc. It is also not uncommon to find a full array of non-refugees operating within the camps: relief workers of both religious and secular motivations; thieves and con artists; government and non-government workers; capable helpers and useless officials. 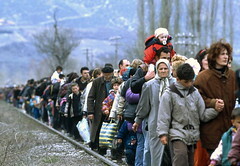 At the beginning of 2009, there were roughly 10.5 million refugees worldwide being cared for by the UN. War, disease, natural disaster, governmental upheaval and good old-fashioned chaos drove these persons from their homes and into foreign territory. Still, there are plenty of Christians worldwide to take care of them all (2.1 billion). We also have an intimate connection, via our faith to the real people currently living as refugees. Did Jesus live on the edge of town in such a camp? Or did Joseph blend in with the locals? What we know is that they lived in Egypt and left without notable incident. We also know that Herod killed a bunch of other baby boys trying to eliminate Jesus. Perhaps this is why Jesus, though as good a Jew as there ever was, just seemed so independent of any conventional wisdom. To live on the edge like that, even for a short time has to have an impact on the way you see others. Did living in Egypt help Joseph appreciate the plights of Abraham, Joseph and the prophets of the Exile? Did this displacement teach Jesus to trust in God, since human life can be so fraught with uncertainty? We do not know the cause, but the know that somewhere, Jesus learned to love the stranger and to see beyond nationality, political persuasion, gender, race, economic status, etc. Thus, Christians must learn to love those who are different from us.